Nothing melts my heart (OK that was a cheap pun – even cheaper than the headline for this post) more than a proper Swiss fondue. 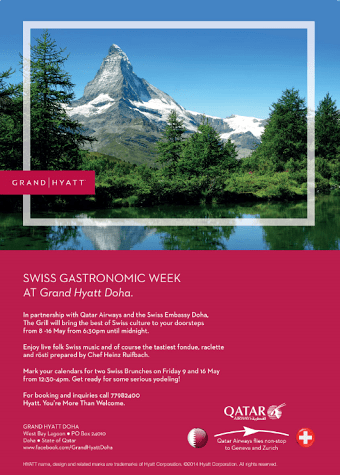 The Grand Hyatt Doha is bringing back its’ popular Swiss Gastronomic Festival for another year. Running from 8 -16 May from 6:30pm until midnight. Enjoy live folk Swiss music and most importantly fondue, raclette and rösti prepared by Chef Heinz Ruifbach. Call 77982400 for bookings and more information. Melted cheese, potatoes, alcohol and sticks to stab things with. What’s not to love?